Running to the grocery store. Thinking of what to make for dinner and have the brilliant idea to ask my teenage daughter, who will babysit while I’m at the market. She can pick what we make and text me a list of ingredients while I’m shopping. Lentil meatballs with pesto? A tough sell but ok since I don’t have any other ideas. We actually have lentils in the fridge anyway. I just have to get breadcrumbs, parmesan and pine nuts. We have everything else on the list. I am home to cries of “What took you so long?” and “Where are the uncrustables?” No comment. Okay, I have left the big kids for an hour at mathnasium around 4:15 and then stopped for a coffee at the drive thru Starbucks. Upside: 3 shots of espresso and I will make dinner instead of lying on the couch watching “The Leftovers.” Downside: Starbucks is a drive through, but everyone in the store can see the drive thru monitor so I feel I have to make hand signals and tilt my head at a flattering angle. Anyway, after an amusing repartee on fb about Steven Moffat and — what was it, not auto-tuning or paranormal — I don’t know, some $100 vocabulary word a friend of mine used, I’m ready to start these lentil meatballs. I can totally get it to the part where it’s supposed to rest for 15 minutes by 5:10 and then get the big kids. Crap! It just takes a lot of doing to actually pick two tablespoons of flat leaf italian parsley even if it does grow in a pot right outside the kitchen door. Plus the lentils wouldn’t pulse in the cuisinart without a lot of water to make it go and now they are more of a paste than a chunky puree. Threw in ricotta (we had some!) parsley, garlic, eggs, parmesan and olive oil (realizing that we have maybe three tablespoons of olive oil in the house. Damn!) Also totally forgot about kids and will now go get them. Whew! Teen daughter is helping make dinner! It was getting a little scary there when I was trying to pick a whole cup of basil from the parsley/basil pot. The chickens were attacking me. I’m actually bleeding on one toe! 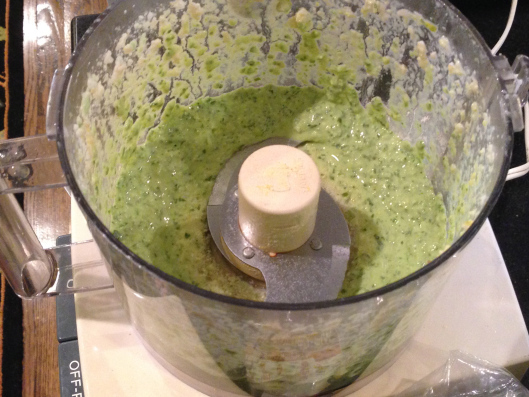 So now, I have the pesto made, but it is not green, more of a light lime or even chartreuse. But I’m not going back out there with those chickens for more basil! I mean, does this look right to you? Teen daughter read this from the recipe “bake until the tops are golden brown, gently turning the balls over halfway through, 15-20 minutes.” And asked “Do they mean halfway is 15 minutes or turn them halfway through 15 minutes?” We are both frozen with lack of understanding, but decide to err on the side of not burning dinner and turn at 7 minutes. What do they mean?!?! Pasta is in, meatballs are halfway (a quarter of the way?) through cooking, and the pesto is still closer to yellow than green. Is there any tomato sauce in the freezer? There IS sauce in the freezer! I have it in the microwave defrosting. I really have to throw away that baked cornish hen I’ve been keeping in there because it’s too smelly for the trash. A second tray of lentil meatballs is in the oven. I’m making heat and serve dinner rolls as well, because I’m nervous about how the lentil meatballs will be received. Tomorrow IS trash day. I’m taking the Cornish Hen out of the freezer and putting it in the trash now! Well, teen daughter loved the lentil meatballs and the pesto, which is good because there are approximately enough leftovers to feed a small army. Everyone else declined to consider trying it and scarfed down all the rolls before I even got one. At least I finally threw away the rotting Cornish Hen . . . This post originally appeared at The Ill-Prepared Housewife. I'm still wondering (often with my octogenarian housewife friend) why it's up to the mom to make dinner?